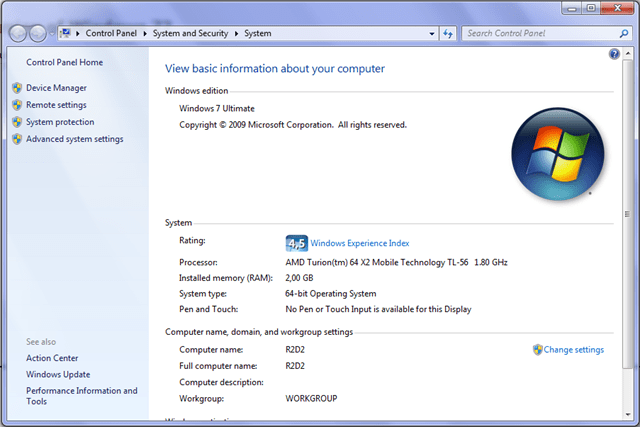 AboKevin.com » What to go for; the 32 bit or 64 bit version of Windows 7? HomeHardware HP dv9074ea What to go for; the 32 bit or 64 bit version of Windows 7? The common advice out there is that unless you have more than 4 GB RAM there really is no need to go for a 64bit version of Windows. Well, I think otherwise. Yesterday, I figured it was time to reformat and install Windows 7 RC on my recently returned laptop. It is a HP dv9074ea from 2006. It has a AMD Turion 64 X2 TL-56 processor, I have upgraded it to 2 GB RAM and it has two internal hard drives, initially both 80 GB drives, but one has been exchanged to a 500 GB one. I have been accepted into the Beta testing program for Windows 7 Norwegian Language Edition (x86) and heading the first advice I mentioned above, thus decided to install the 32 bit Norwegian Language RC on the laptop. The install went fine, but I was greeted by something far from a clean device manager afterwards, and had to install Vista drivers in order to have the system running. I then went through the hoops detailed in my install guide. But things did not continue smoothly. Far from it. Norton Internet Security 2009 were not allowed to run its heuristic drivers (incompatible according to the OS), I experienced several systemwide hangs, and had to force a log out to have the OS respond to keystrokes on several occasions. After having installed several of my applications I ran a Windows Update and were met with the Office 2007 SP 2 download – a huge one. For me that was a decision point. I was not happy with they way my system was running. It seemed at times slow, non-responsive and flat out buggy. That coupled with the fact that I am now so used to the English version of the OS that I did not feel at ease with a Norwegian version, made me decide to reformat again. This time I installed the English x64 version from a USB memory stick (check here for instructions on how to do it) and it took a total of 15 minutes from I restarted my machine, reformatted the C drive, installed Windows 7 RC to be greeted by the desktop. The Device Manager was not completely clean, but a Windows Update found the missing drivers and the system was really running fine. I have now installed almost all my frequently used applications and the system works the way I want it to – smoothly with no problems. Funny fact; I even have a slightly better Windows Experience Index on the x64 version; 4.5 as opposed to 4.4 on the 32 bit version (both due to the integrated Nvidia GeForce 7600 Go video card). I am not completely sure whether this is due to the 32 bit OS or to inherent bugs in the Norwegian Language version of Windows 7 RC, but the user experience made it an easy choice. Yes I had to install everything again (not hard – just time consuming), but definitely worth it.